Synchronous communication with tty programs. PtyProcess provides synchronous communication with tty based programs. The communications channel used is a pseudo tty (as opposed to a pipe) This means that programs which require a terminal will work. Definition at line 36 of file process.h. Check process exit status for process pid. On error (no child, no exit), return -1. If child pid has exited, return its exit status, (which may be zero). If child has not exited, return -2. Definition at line 162 of file process.h. Definition at line 124 of file process.cpp. Definition at line 152 of file process.cpp. Basic check for the existence of pid. Returns true iff pid is an extant process, (one you could kill - see man kill(2) for signal 0). Definition at line 75 of file process.cpp. Definition at line 96 of file process.cpp. Enables/disables local echo on the pseudo tty. Definition at line 450 of file process.cpp. Definition at line 164 of file process.cpp. Forks off and execute a command. The command's standard in and output are connected to the pseudo tty. They are accessible with readLine and writeLine. args The arguments to the command. Definition at line 324 of file process.cpp. Returns the filedescriptor of the process. Definition at line 121 of file process.h. Definition at line 126 of file process.h. Read all available output from the program's standard out. Definition at line 247 of file process.cpp. Reads a line from the program's standard out. Depending on the block parameter, this call blocks until a single, full line is read. block Block until a full line is read? Definition at line 175 of file process.cpp. Definition at line 159 of file process.cpp. Overwrites the password as soon as it is used. Relevant only to some subclasses. Definition at line 111 of file process.h. If a line of program output matches this, waitForChild() will terminate the program and return. Definition at line 83 of file process.h. Definition at line 105 of file process.h. Puts back a line of input. line The line to put back. Definition at line 311 of file process.cpp. 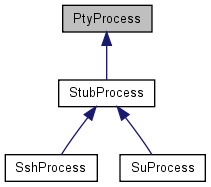 Reimplemented in SshProcess, StubProcess, and SuProcess. Definition at line 625 of file process.cpp. Waits for the child to exit. Definition at line 486 of file process.cpp. 1/10th of a second is 100ms), using fd as a filedescriptor to wait on. Returns select(2)'s result, which is -1 on error, 0 on timeout, or positive if there is data on one of the selected fd's. ms must be in the range 0..999 (ie. the maximum wait duration is 999ms, almost one second). Definition at line 59 of file process.cpp. Waits until the pty has cleared the ECHO flag. This is useful when programs write a password prompt before they disable ECHO. Disabling it might flush any input that was written. Definition at line 412 of file process.cpp. Writes a line of text to the program's standard in. line The text to write. Definition at line 302 of file process.cpp. Definition at line 169 of file process.h. Definition at line 171 of file process.h. Definition at line 170 of file process.h.